Can you use one cell booster for two buildings? Do you have great cell signal at work? Do you have to go outside to take a call? Do your friends or kids tell you they tried to text you and it didn’t go through? Up to 90% of people experience bad cell service every day. Are you one of them? I’ve been talking for years about cellular signal boosters for home. 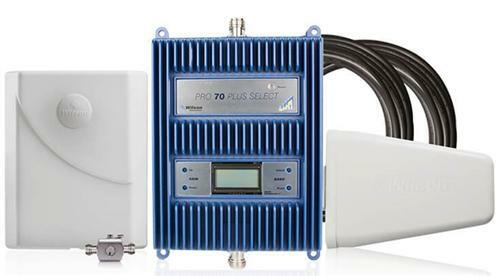 Installing a cell booster at home is one of the easiest and most rewarding projects you can take on. However, putting in a cell booster for business can be a little harder. Why? Businesses are a lot bigger. There are a lot more people. It takes special equipment to handle them. If you have a very small business you could just put in a consumer cell booster like the weBoost Connect 4G-X. I’ve installed them myself and they’re great boosters. For a 5,000-7,000 square foot open space, it’s just what you need. However, if your business has aluminum studs and all sorts of wiring running through it, that range can be a lot smaller. That’s the problem. You need that coverage, and a residential cell booster just isn’t up to the task. That’s where commercial boosters come in. Both WilsonPRO and SureCall make commercial grade cell boosters that can be customized with extra antennas and all the power you need to cover a commercial space up to 70,000 square feet. That’s what you’re talking about, right? Of course that’s great if you work in an aircraft hangar. What if your offices are in two different buildings? Of course this happens all the time. Businesses outgrow their original headquarters and start expanding into additional bays, sometimes into additional buildings. What’s the best way to cover the entire corporate campus with great cell service? A lot of time it means multiple cell boosters. That can be an expensive proposition though, and it means that you have equipment in multiple locations. Even though most cell boosters need only the slightest maintenance every year, they do need to be checked sometimes. Keeping multiple equipment rooms can create all sorts of problems. You might be tempted to buy the biggest possible cell booster and use it for two adjoining buildings. It can be done! If you have two buildings you may have conduits between the two buildings. You can run cables from a single base unit to an antenna in another building, and use a second, third, or fourth antenna somewhere else. The problem here is that you’re running a lot of cable. As signals travel through cable, they lose strength. Even low-loss cable can’t stop that. So, if it takes another 200-300 feet of cable to get the antenna into the second building, that could compromise the effectiveness of the system. Most of the time you can’t add amplifiers to the line to make up for that loss. There is an option if you only have one very long run. The WilsonPRO 1050 series is the only booster system available that has a coordinated amplifier. The little amplifier you see at lower left can compensate for an additional 300 feet of cable run. While that’s a good solution, it’s not one size fits all. Sometimes you need two long runs, and you can’t add a second mini-amplifier. The system just doesn’t work if you try to do it. This is definitely a case where you can do a thing, but it’s not really clear that you should. In general, you’re much better off getting a professionally designed system. Luckily for you, it’s very easy to get a cellular signal booster designed by a pro engineer… for free! The folks at Solid Signal are ready to help you get the system you need, complete with all the parts it’s going to take. If this means one booster for two buildings, we’ll design it. If it means multiple cell boosters are the right choice, we’ll do that too. How can you get started? Just call us at 877.312.4547! FROM THE FORUMS: 1 booster, 5 buildings? Can a Bluetooth device be hacked? CES2016: Introducing SureCall’s 2nd Generation EZ4G Booster! NICE AND EASY: Will an air conditioner interfere with a cell booster?